I’ve never been one to go in for the “special edition,” as the bare bones versions of most games are already extravagant expenditures without any extra window dressing. Not that I don’t lurv me some shiny tin packaging, miniature art books and dramatically posed figurines, ’cause I do. It’s just that all that extra cash could be better spent on another game, or worse case scenario the DLC that probably should have been included from the start, which the publishers could see if they weren’t blinded by so many millions of microtransaction dollar signs. Still, it’s gotten especially hard to resist lately, with seemingly every other title sharing shelf space with a “Special,” “Collector’s” or “Deluxe” version of itself, but resist I have. I have successfully steeled myself against Halo 3‘s Spartan helmet-sporting Legendary Edition, Fallout 3‘s Pip Boy 3000-equipped Survival Edition and Modern Warfare 2’s night vision goggle-enhanced Prestige Edition. 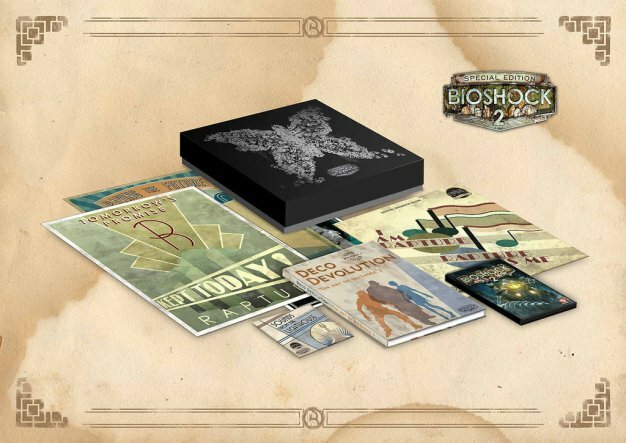 But BioShock 2‘s Special Edition is finally going to break me. Revealed today on 2K’s Cult of Rapture community site, the $99 Xbox 360 and PlayStation 3 set ($89 for PC) will include three Art Deco-inspired posters, a 164-page hardbound art book, and a copy of the orchestral score both on CD and – here’s the true collector’s pièce de résistance – on a vinyl 180g LP. Oh, and there’s the game too. All packed into a lovely 13″x13″ inch package and limited to a single production run. I don’t know about you, but my resistance faltered right around Art Deco. Both the special and standard editions of BioShock 2 are scheduled to release on February 10.